You can purchase the download of the single from Zunior.com. I was 17 in 1980. It was my second time in the studio. We'd only just named ourselves Rheostatics, or rather, Mike Dunn had. Wispy-haired, normal, and pale, he was my lab partner in Grade 10 science class at Kipling Collegiate and he worked in the stockroom at Duke Cycle and Sports, which, in our Etobicoke suburb, was a pretty cool part-time job. I asked Mike if he knew any good band names, and he said, "Rheostatics?" Me and Tim said, "Yes. That is so awesome," even though we didn't know what the word meant (it meant nothing). The studio was called Round Sound. "It must be good a place," we might have thought, "because it rhymes." We were going to make a single-- a 45-- which is what young bands used to do if they could borrow enough money from their parents. In 1980, we knew about ten songs and a few covers. We weighed the original compositions, deciding whether we should do "Plastic Lake" or "The Chase" or "Satellite Dancing." We chose the latter. 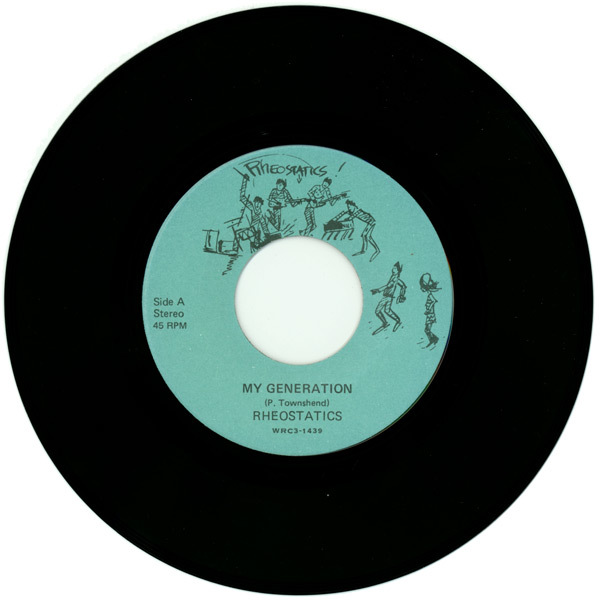 We also chose a cover: The Who's "My Generation." We wrote a cheque to Peter Townshend for 35$-- had to get the legalities out of the way, first-- and, on a Saturday morning in the springtime, we drove to Scarborough (it might have been East York or Leaside, I'm not sure) and rapped on the studio door. A damaged intern who'd been recording all night mumbled at us and let us in. Walking into the bright studio was like entering the International Space Station or the Taj Mahal or the Tal Mahal if it was floating in space. All day, we played catch up with our guts and our nerves, never winning and, never coming close. We wore headphones, which I stepped on every few minutes, snapping them to the ground. We used a standing control box to dial in the sounds but, in the end, left everything blaringly loud and unmixed. To start, we laid down "bed tracks," a term I'd read about in a Robert Plant biography I'd just finished reading. The idea that we were laying down "bed tracks" was almost great enough, and, in a way, it didn't matter if they were any good; it only mattered that they existed. Our drummer, Dave Clark, played his track ably and professionally-- he was the seasoned corporal of the group, having been around professional musicians for a lot of his young life-- while the rest of us flailed away. Tim Vesely met the challenge-- Tim has always been strong under pressure-- and our synthesizer player, Dave Crosby, did well, too, overdubbing and overdubbing until someone told him that maybe 15 tracks of keyboards were enough (Dave looked disappointed that they were). Me, I sweated through my shirt and jacket and my throat got dry before singing. One of the studio engineers-- a new engineer took over halfway through our session-- suggested I "take a drink of water" and I was so thrilled by the fact that someone-- a professional studio engineer-- was giving me "musical advice" that I pushed through my take without screwing up too bad. In the end, we used some weird flange to mask the tunelessness of the singing, but that was okay. These were New Wave times and sounding weird was good. We spent 14 hours in the studio doing two songs. I couldn't tell if that was a lot of time or not but it was over too soon. I got home in the middle of the night and laid there in bed, wondering if all of that had just happened. We got the record mastered at the Lacquer Channel. Tim and I went there and watched as the legendary George Graves-- he wore rainbow-coloured suspenders-- finessed the recording on to vinyl, right there in front of us. A few weeks later, someone phoned my home to say that the 45s-- 1000 of them-- were finished. I asked my dad if he could pick them up. He was driving with his boss and co-worker, Murray Frum-- Barbara's husband and David's dad-- and they passed the pressing plant. So these two dudes pulled their car-- my dad's or Murray's, I can't remember-- to the loading bay and the two of them loaded by hand the first Rheostatics record into the trunk and in the back seat, bringing them from the suburbs into the city. That was 35 years ago.